This piece is written for four wind instruments (brass or woodwinds), which share at least two octaves of range in common (in the score, the clefs are not specified but the four musicians must determine which clef they will read (treble, alto, tenor or bass), and it must be the same for all the four musicians. Also, the four instruments must have the same transposition in case of transposing instruments, or must be able to transpose from the score written in C, except for the instruments in Bb or Eb, for which a score is provided. This piece, made of twenty-six independent sonneries, will be played before or/and after the concert, as the audience arrives or leaves. The musicians will then be placed outside the concert hall (corridors, garden, parking garage, subway station, etc.). The musicians will play from locations that will not be visible to the audience. Optimally, the musicians should be distributed across different locations. 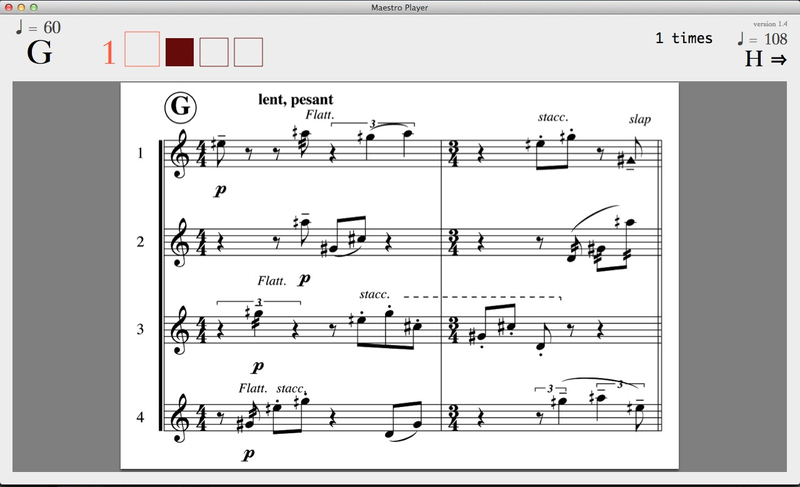 Another possibility is for the musicians to move across the audience, with the score attached to their instrument (with the syncrhonizationsoftware runing on an attached smartphone, or with a wireless headphone). The 26 independent sonneries are labeled with letters. The sonneries will be interrupted with pauses of an irregular duration (from 3 to 25 sec.). The sequence of the sonneries as well as the length of these pauses will be determined in advance by the musicians. The formation of a word from this system of letters, with or without semantic meaning, can aid as a mnemonic device. One may repeat the same sonnerie many times, or conversely, it may be omitted. 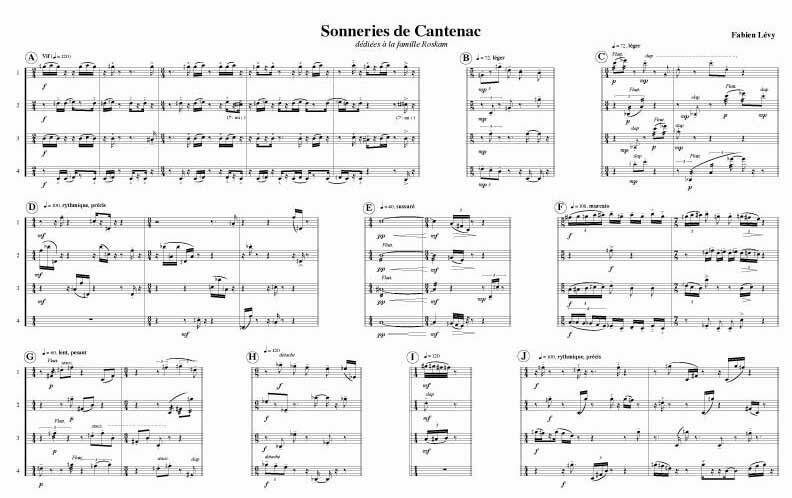 A computer software, Maestro, with visual and audio clicktracks and view of the score, has been made to synchronize the beginnings and the tempi of the sonneries. Please contact me to obtain it.